SOUL WEAVING draws its inspiration from the old harp, bagpipe and singing styles, from the transitional compositional styles of, say, 18th Century Irish harper Turlogh Carolan or 18th Century Scottish fiddler Robert Macintosh as well as from the succeeding music which has grown from those roots during the 19th and 20th Centuries. Going a step further, the band is one thread among many which are weaving the essence of the old music into new musical patterns, exploring original shapes of melody, compositional form and structure. 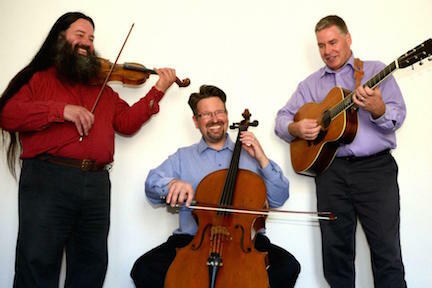 THE BAND is comprised of three experienced musicians who delight in exploring the creative magic within the music using fiddle, concertina, voice (Jonathan Goodwin), guitar (Ehlert P. Lassen) & cello (Stephen Evans).